At an afternoon reception following Sunday’s Commencement ceremony at Eastern Mennonite University, Center for Justice and Peacebuilding Executive Director Daryl Byler reminded the 29 graduates that they were now members of a huge and hope-filled network: 638 alumni from 78 countries currently working in 65 countries. CJP conferred a total of 29 degrees. 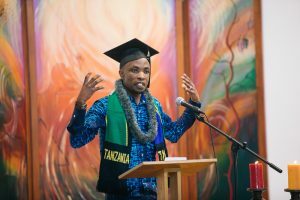 Graduates came from nine states and the District of Columbia, as well as 12 countries: Spain, Saudi Arabia, Republic of Korea, Sudan, South Africa, New Zealand, Colombia, Taiwan, Tanzania, Brazil, Iran and Kenya. 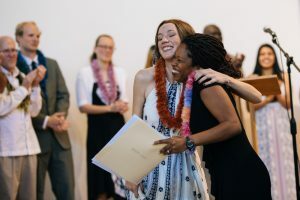 Sylvia Menendez Alcalde hugs Professor Johonna Turner during the CJP graduation reception Sunday afternoon. Fourteen degrees were conferred in conflict transformation and three in restorative justice. Additionally, three students earned graduate certificates in conflict transformation, and one in restorative justice. These graduates are particularly significant, as Commencement speaker Leymah Gbowee MA ‘07 was instrumental in the founding of the program in 2011. This cohort’s successful completion brings the total number of WPLP graduates from Africa and the South Pacific to 42 women. 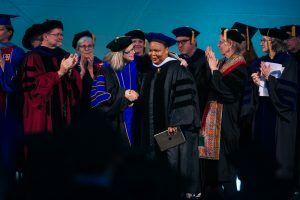 Earlier in the day, Gbowee became the recipient of the university’s first honorary Doctor of Justice degree “for her extraordinary achievements in peacebuilding or social justice work,” according to Provost Fred Kniss, who ceremonially made the recommendation to President Susan Schultz Huxman. Read Leymah Gbowee’s 2018 Commencement address. President Susan Schultz Huxman congratulates Leymah Gbowee MA ’07 after the presentation of the honorary Doctor of Justice degree. “In one hundred years of EMU’s existence, who would have told anyone that a girl from West Africa, a tiny village, a tiny country, who came here to validate and to justify her inclusion in peacebuilding work at the community level would come back several years later as the first honorary degree awardee?” Gbowee said, after giving thanks for the award. Kajungu Mturi talks about the impact of his time at CJP. 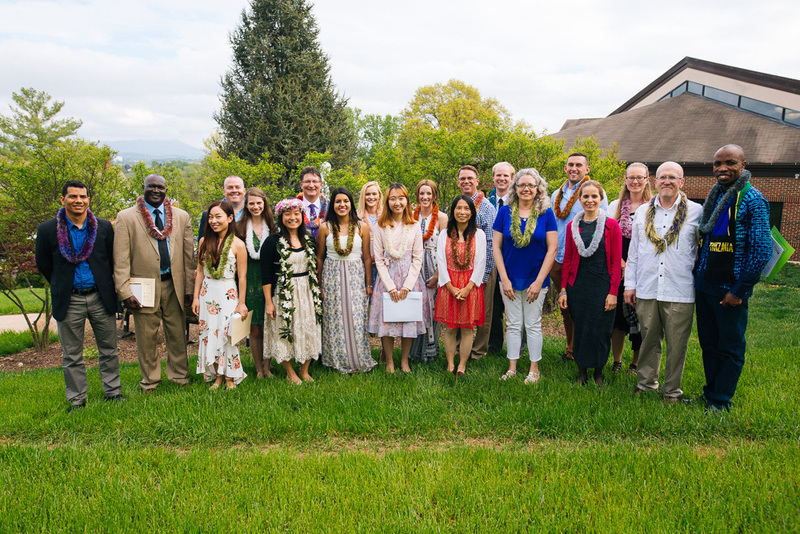 Kajungu Mturi, of Tanzania, and Jennifer Chi Lee, of South Africa, were selected to address their classmates, faculty and friends at the afternoon reception. Lee passed around a spindle of red yarn, replicating a process that had been shared in a reflective circle among graduates and CJP community a few days before. 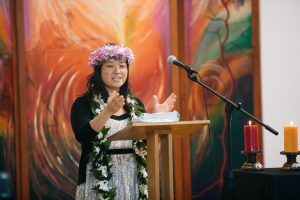 Jennifer Chi Lee was the second of two graduate speakers. She urged her classmates to find the threads, “sleep with the bread that makes us feel safe,” and embrace the mystery, the risk, and the unknown of the promise of peace. A tradition of the reception is for professors to give short speeches about each graduate. In his welcoming introduction to this part of the reception, Professor Carl Stauffer highlighted how close the community becomes. Matthew Ryan Fehse, Redding, Calif.
Liana Rose Hershey, Mount Laurel, N.J.
Ian Steele Pulz, Cranbury, N.J.
Brian McLauchlin, SVD, Washington D.C.
Matthew Michael Tibbles, Harrisonburg, Va.
Deborah M. Bayless, Raytown, Mo. Jesse Noël Morales, Greensboro, N.C.
Lyle D. Seger, Lawrence, Kan.